Ty Rattie, who played 13 games over the last two seasons, has been called up from the minors to take Jaden Schwartz's place. The St. Louis Blues have won five straight over the New York Islanders, though the two players who have been most productive for them in that streak won’t be on the ice Saturday night. That’s because the injury-plagued Blues traded away T.J. Oshie, and Kevin Shattenkirk remains out with a lower-body injury for this opener of a five-game homestand. St. Louis (5-2-0) has outscored New York 25-12 in this win streak, with Oshie and Shattenkirk combining for 20 points. Oshie is now with Washington while Shattenkirk will miss his fifth straight game. The Islanders have dropped their last four visits to St. Louis since a 6-3 victory Dec. 6, 2005. The Blues are also without Paul Stastny and Patrik Berglund due to injuries and will be further short-handed since winger Jaden Schwartz was injured in Friday’s practice when he collided with a goalpost. Schwartz is one of six skaters tied for the team lead with four assists. "Obviously he couldn’t finish practice, so that’s the first alarm bell that goes off," coach Ken Hitchcock told the Blues’ official website. "We sent him to the hospital to get a further evaluation and we’ll give you an exact update on time frame (Saturday)." Ty Rattie, who played 13 games over the last two seasons, has been called up from the minors to take Schwartz’s place. "Knowing him, I think he’s really going to take advantage of this," Hitchcock said. "He’s on that cusp of being an NHL player, and I don’t think he’s going to miss the opportunity to come up and play right now." 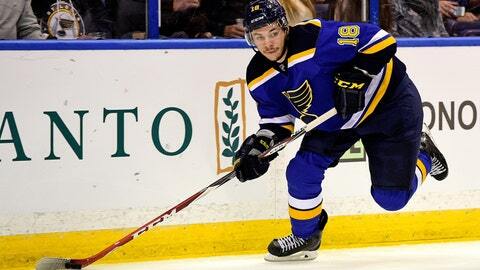 St. Louis wrapped up a 4-2-0 trip with Tuesday’s 3-0 loss to Montreal. Vladimir Tarasenko’s six-game run in which he piled up a team-high nine points ended. The Blues had 38 shots against the Canadiens and are among the NHL’s leaders with 33.0 per game. New York (4-2-1) is also in that group with an average of 32.3 shots, though it was held to a season-low 26 in Friday’s 5-3 home defeat to Boston that ended a four-game win streak. "We didn’t do a good job of complementing each other," coach Jack Capuano said. "You can’t turn the puck over in this league and expect to win. We have to play a lot better than that." John Tavares had a first-period assist to extend his point streak to five games after he amassed eight in the Islanders’ win streak. Anders Lee saw his four-game run end. Capuano said there’s a chance that winger Steve Bernier could make his club debut Saturday. Bernier has been out with a lower-body injury. New York is well aware of its recent futility against St. Louis. "We wanna win tomorrow," Tavares said. "Tough place to play against a good team that’s rested. We’re going to have to be a lot better than that (Friday), play a smarter game." Former Blues goalie Jaroslav Halak made 21 saves Friday, though it’s unlikely he will start this contest after he missed the first four games with an injury. Backup Thomas Greiss is 2-0-1 with a 2.64 goals-against average in three starts this year, and has posted a 2.01 GAA in winning both starts in St. Louis.